The first 128-hp-cars ran starting from September 1972 from the pile. In November 1972 the homologationpapers were submitted to the FIA, which meant that from September to November 1972 accurately 500 CSA had been produced. In fact one dozen became actually finished, which went by the way completely into the rallye worksmission. But exactly the same also all other manufacturers cheated, and so the FIA commissioners closed all eyes and gave to 1 January 1973 the homologation for the group 4 (Gran Turismo Speciale = special GT). Group-4-racers were allowed almost all possible increases in output and body change exhibiting - they could do easily 50 - 75 percent more achievement reach than the basic version. The appropriate FIA paper was given to 1 January 1974. Searches of the 124-Abarth-Registers R.A.R.E. permit the conclusion due to three easily different CSA series from each other differentiating were manufactured and delivered. After only three years the 124-Abarth-Production ended, because Fiat had the interest in this car lost and with the model 131 already a new hope carrier in visor. Developed from 1972 to 1975 should exactly 1013 124 Abarth produced (which bites itself temporally with the homologation data, which speak of only one year production duration). It is not to be excluded however that all CSA became finished by November 1973 and became only later delivered and certified. Searches of the Registro Italiano Abarth let assume even that at the most 950 CSA became finished. Officially however 995 CSA documented, supplemental by 17 group-4-racers. 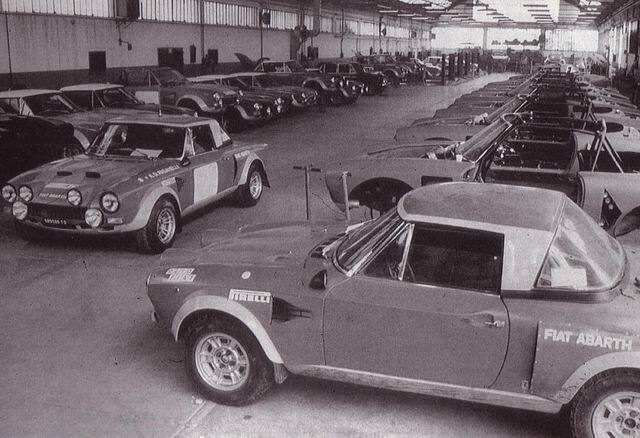 Allegedly after 1975 finished Abarth Rally became certified surely only for a long time after the actual production end. Genuine falsifications are at present rather improbable, the change of a BS1 or a CS1 involves immense costs, which might lie over the today's sentimental value of the CSA. Selling became the CSA first only in Italy, where at that time approximately 17,000 Marks (about: 8.500 €) were to be put on - approximately a third more than for the 11,600 Marks (about: 5.800 €) expensive CS1. Approximately 400 copies remained in northeast Italy (Venetien, South Tyrol, Trentin and Friaul). The completely large business were they however never for Fiat, even if for it at least in Italian magazines strongly the boost were agitated. With heating up sayings like "Con una macchina come questa, chi vuole può, correre" (about: Everyone, who wants it, can be fast with as a car as a running driver on the way) or "Su richiesta la Abarth metterà a disposizione della Clientela un allestimento speciale per l'impiego agonistico" (about: Optionally the company Abarth can put all only conceivable tuningparts for competition purposes at the disposal) appeal those to Fiat recruiting rate gene against the child in the man. In Germany the civilian Abarth Spider was located starting from 13 September 1973 with 19.950 Marks (about: 10.000 €), afterwards with 20.950 Marks (about: 10.500 €) in the price list and was more expensive thereby approximately six large bills than the Normal-Spider. Starting from 1974 the Heilbronner Fiat importer sold accurately 18 civil cars. In the year before was a 24 page operating instructions in German language had been printed - which lets assume that they had wished more sales in Germany! The official sales ended on 29 July 1974. Further export of countries were Switzerland as well as the Benelux states. 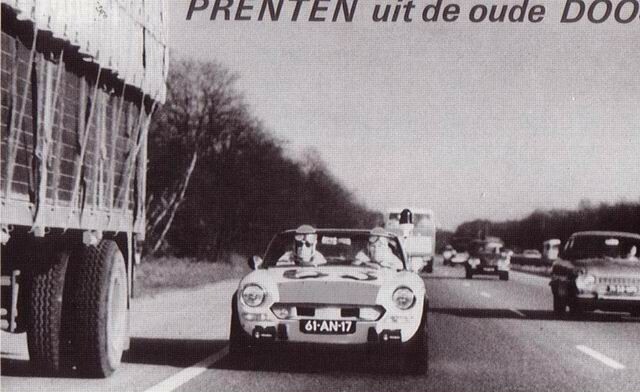 Three of the fast 128-HP-racers (supposed the chassis numbers 124CSA0069744 to 124CSA0069746) served the Dutch motorway police Driebergen with the hunt for speeders as mobile supports - over their destination is nothing known. The CSA was never exported to Great Britain, also right-guided Abarth Spider thus never gave it ex factory. And the CSA likewise never went officially into the USA, because otherwise there appropriate nationally supervised Crashtests and exhaust series of investigations of the Environmental Protection Association (EPA) would have had to be accomplished. With the advised number of 500 to 1000 cars was not worth this. At least two CSA arrived into the new world: A US-G.I. from Vincenza had transferred one to California, the other was driven by a New Yorker policeman. One Abarth Spider (chassis number 124CSA0069037) moved in the meantime even to Africa: The car "lived" until recently in Nigeria.